We received some very cute velvet elastic from the Sunshine Shoppe and were so excited to do a tutorial with it. The elastic is super cute! It just seems a little more special than regular elastic. The Sunshine Shoppe has sooo many things in their shop- tons of supplies and tons of fold-over elastic in many many different colors. Anyways, their shop is great so go check it out! 1. Gather your supplies- Velvet elastic (22 inches), Embroidery String and Baker's Twine. 2. Cut your elastic to at least 22 inches. Cut your string and twine you about 5 feet. This may seem long but you will need a lot of string. 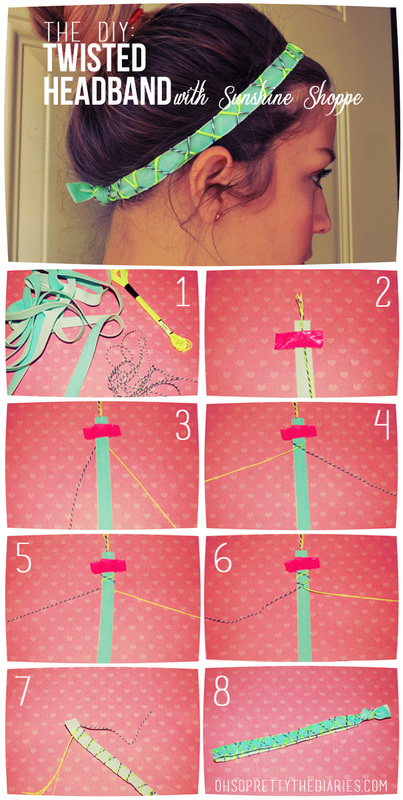 Tie a knot in the two strings and tape it to the back of the elastic. Wrap the tape all the way around the elastic. 3. Tape the group down to your table, velvet facing upward and strings underneath. 4. Cross the string over-top the elastic. 5. Cross the strings underneath the elastic. 6. Cross the strings back on top of the elastic and cross them again. After you do that twice, cross the string underneath the elastic again. Repeat steps 4-6 over and over until you reach the end of the elastic. 7. Tie a knot in the two strings at the end. 8. Take the tape off the first end of the elastic and tie the two ends off elastic together. We kept some of the elastic hanging out of the knot. Trim the elastic to be the same length and trim off any string that is hanging out of the knot. this is really cute! I'm curious if the string slides around though. I can't imagine how it stays looking so perfect without glueing it down or something every so often. Since the elastic is velvet, the strings don't really slide around. They shift when you stretch the elastic but they don't all bunch up or anything. The velvet prevents that from happening.